Join Us!!! We are looking for someone to help us cover COCABA-Championships basketball. Please send us an e-mail. Mexico won COCABA U16 Championship as they celebrated victories in all the games. Last night Mexico triumphed with a 76-64 win over Costa Rica. Mexico won the first period 22-15 and added a 23-17 rally before the halftime. Costa Rica managed to reply with a narrow 12-11 rally in the third period, while both teams scored 20 points each in the last stanza. Javier Gonzalez top-scored for the winners with 20 points, whilst Villavicencio posted 15. Morun replied with 14 points in a loss and Davis added 12. 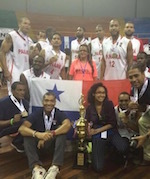 Panama celebrated the COCABA Championship title. They overcame Costa Rica in the Final in San Jose. Trevor Gaskins (188-G-89, college: Louisiana Tech, agency: Lat Am Basketball) notched 24 points and 8 rebounds to pace the winners. Panama registered a 33:17 halftime lead. They boosted the margin at 27-point mark at the final intermission. Panama did not loosen the grip in the fourth frame and cruised to the triumph. Ruben Garces (206-C/F-73, college: Providence, agency: Agency) had 16 points and 9 rebounds for the champions. Rohel Wilson (197-F/C-89) responded with 10 points for Costa Rica. Nicaragua finished in the third position at the COCABA Championship. They beat Mexico in the consolation final in San Jose. Vansdell Thomas (179-G-86, agency: Aspire Sports) nailed 17 points and grabbed 11 rebounds to pace the winners. Nicaragua eked out a 37:36 halftime lead. They extended the margin at 7-point mark at the final break. Mexico pulled closer in the fourth frame but could not avoid the loss. 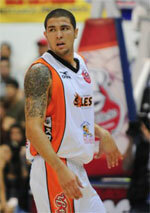 Bartel Lopez (212-C-89, agency: Duran International) delivered 16 points and 15 rebounds in the victory. Fernando Benitez (204-F/C-89) responded with 15 points for Mexico. Honduras wrapped up their COCABA Championship campaign on a high note. They defeated El Salvador to occupy the fifth position. Christopher Flores (188-G-90, college: NJIT, agency: Scorers 1st Sportmanagement) and Alvin Cacho (189-G-82) posted 19 points each for the winners. Honduras built a 44:21 halftime lead. They extended the lead at 25-point mark at the final intermission and never looked back en route to the victory. Marco Banegas-Flores (185-G-92) chipped in 14 points for the winners. Carlos Arias (200-F/C-89) responded with 14 points for El Salvador. Panama survived a double-overtime thriller to tame Mexico in the semifinal clash in San Jose. Trevor Gaskins (188-G-89, college: Louisiana Tech, agency: Lat Am Basketball) scored 28 points, 11 rebounds and 7 assists to lead the winners. Mexico recorded a 28:20 lead after the starting quarter. But Panama denied the deficit and surged ahead for a 4-point lead at the third break. Mexico however denied the deficit in the fourth frame and forced overtime. The teams traded baskets throughout the first extra period. But Panama stepped on the gas in the second overtime and managed to secure the winning outcome. Josimar Ayarza (205-F-87, college: S.Mississippi, agency: Agency) delivered 20 points, while Jonathan King (198-G/F-90) added 16 points in the win. Jesus Gonzalez (195-F-86) responded with 21 points, 10 rebounds and 5 assists for Mexico. Fernando Benitez (204-F/C-89) had 30 points in the loss. Costa Rica held off Nicaragua and advance into the COCABA Championship Final. Carlos Quesada (198-C-85) scored 17 points and grabbed 13 rebounds to pace the hosts. Costa Rica posted a 25:18 halftime lead. But Nicaragua narrowed the deficit and eventually tied things up at 32 heading into the fourth quarter. But Costa Rica held their opponents to just 10 points in the final frame and raced to the victory. Daniel Simmons (194-F/C-80) delivered 12 points for the home team. Bartel Lopez (212-C-89, agency: Duran International) responded with 19 points and 14 rebounds for Nicaragua. Vansdell Thomas (179-G-86, agency: Aspire Sports) had 9 points in the loss.